We are all exhausted ... Late night last night to early wake up to be at clinic this morning early equals not a lot of sleep! Emily stresses a lot when she has to get accessed here in Michigan because a couple of times they accessed her a couple of times with no blood draw! But this morning it went ok ... We figured she would need platelets since she had quite a bit of bruising on her legs, arms and head. As figured her platelets were 18 even after getting 3 units of platelets on Friday back home. Bad news her ANC is 0 again. Neutropenic in Michigan is not where we wanted to be... EspeciAlly if she gets a fever, we head inpatient here which is not where we want to be. So we are staying away from people and hoping to keep her fever free! Dad and I are happy we brought the camper because she doesn't have to be trapped in the renuncci hospitality room (most likely without kitchen) and can move around our camper and also go outside and not be around a lot of people! Today was a long day... We didn't think we would see Dr Sholler this visit because we knew she had a conference of some sort this week. So this morning when she walked in, we were surprised. She was leaving within the hour to catch a flight to south cArolina to talk about dfmo! After catching her up and what information she had, she wanted an additional testing done for MDS from her bone marrow aspirate and biopsys that she had this morning. We talked about the DFMO trial because this is where dad and I feel would be best for Emily right now. 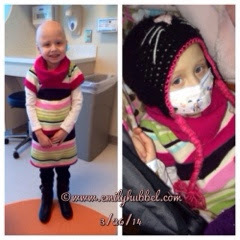 Emily's bone marrow needs a break from chemo, she wants her hair to grow back and she needs rest from the hospital. The 2-3 visits a week along with Inpatient stays right now isn't where we want to be. Emily has been battling neuroblastoma for over 3 years with lots of chemo, it's time to give her a rest. Don't get us wrong we are nervous about this change to compassionate trial of DFMO worrying over her progressing again or bone marrow not start getting better but dad and I agree it's time to see how she does. Dr Sholler agreed she felt this was a good move. So papers were signed for compassionate use DFMO trial today, hearing test done and now we move forwArd to scans tomorrow with MIBG and Friday PET scan. As for hearing test results showed she has lost high frequency hearing and it is more severe in her left ear. They didn't feel that hearing aids were needed at this time but said that she may need a personal FM system to help at school. We noticed it yesterday in the truck with a lot of background sound and Brianna talking , trying to talk with her she could not hear. At this point bone marrow needs to be negative to start dFMO trial. The compassionate use means she is on a trial but it is not as strict as the one for NED! She did well with the bone marrow today, and had a little pain after but handled it well. She also did well with all pre meds for platelets and platelets well. She hAd some coughing from the platelets but we have noticed that quite a bit lately! While we have been here blood pressure has been looking pretty good. It did go very low during bone marrow but was explained pressures normally go down with sedation and hers are a little more lower bc of her meds that she is taking but nothing they were concerned about! Tomorrow is MIbG scan so hopefully she does well tomorrow and please continue to hope for stable or better. Wear your Emily gear tomorrow or Friday (and if you don't have gear, wear purple and pink to show your support of Emily! Thank you again for loving our girl and supporting us! It means so much to our family!! Please hug and kiss your kids and tell them how much you love them! Continuing to pray for you Emily!